We had our friends from PaleoSchmaleo stop by to share a recipe with us today. I am personally a huge fan of bison meat and I am glad others are help spreading the message of it's deliciousness. I might upset a few people, but when I have the choice of bison meat vs. beef, I always choose bison. Just in case you are wondering, I get all of my bison including for this bison chili from US Wellness Meats. WAIT! Just because it says Bison Chili, don't run! Some people can be a little gun shy at trying different things. You have to try this yummy stew! Our Bison Chili is so easy to make and so good your taste buds will dance; promise! AND it's Whole 30 and 21DSD approved so if you have never had bison, now is the time to try it. Here are some not so common facts about bison you may or may not already know. It is much leaner and packs a lot more protein than typical cow beef. Has less cholesterol and a higher ratio of fatty acids like Omega 3's compared to beef. In short, bison or bison chili in this case is the holy grail of red meat. It's like feeding your body the “premium” gas rather than 87. Your body will thank you as it's cruising right along in this thing we call life. Can you guess what the best part about this recipe is? CROCKPOT! Yup, you get to set it and forget it! We love crockpot recipes. For us working gals, it is seriously the best way to make a tasty meal with little to no effort! Dinner for the WIN! You're welcome. Dish yourself up a bowl and sprinkle with cilantro or red onions or maybe a squirt of lemon! I’ve made this recipe countless times. It is delicious! I crave it in the winter months. Instead of the crockpot, I put it in the instant pot for 30 minutes high pressure. So yummy!! This is a delicious recipe! I made it with ground beef, but will keep an eye out for bison. Thanks for the great recipe! 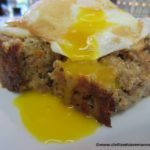 I am thrilled to see you post a recipe for my all time favorite protein! I am definitely making this! I’d love to see what you would do with bison for breakfast or a meatloaf.